How do Black Lights Work, Why do Highlighters Look So Bright, and How Can You Impress Your Significant Other with Science? Prepare to embark on a colorful and illuminating journey. Did you know that there is a secret world that exists right in front of your eyes? Did you know that we scientists have tapped into this secret world and are exploiting it to push the boundaries of knowledge? Me. In My Secret World. Do you have a yellow highlighter by you? Hurry! Grab it and follow along! Using the highlighter, draw a box on a sheet of paper. Below is my highlighter box along with one drawn using a sharpie for comparison. Wow, that is one fine bright yellow! Since we could all use a bit of exercise, take your highlighter drawing and venture out into the sunshine. Do you notice that the box you’ve drawn seems to get even brighter? It almost seems like it is glowing, appearing more yellow than before. So what causes this awesome display of extra brightness? Well, the answer is a phenomenon called fluorescence, and it is the key to the secret world around us. Fluorescence happens when something absorbs light of a certain energy and then emits light with (typically) less energy. To better illustrate fluorescence in action, let’s look at our highlighter drawing under black light. In this setup, the black light provides high energy ultraviolet (UV) light, which is invisible to our eyes. Chemicals in the highlighter ink absorb the UV light and spit it back out as lower energy, visible yellow light. This also happens in sunlight, but the large amount of visible light the sun sends out makes it harder for us to see the fluorescence! 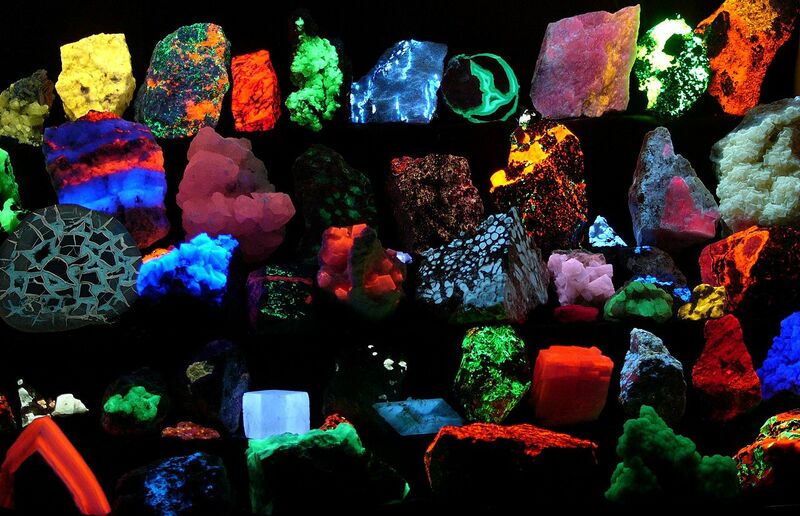 In addition to highlighter, many other common materials fluoresce, including tonic water, cleaning products, antifreeze, some minerals, and even you! (kind of). You are a fluorescent factory in action, as both your blood and urine are fluorescent. 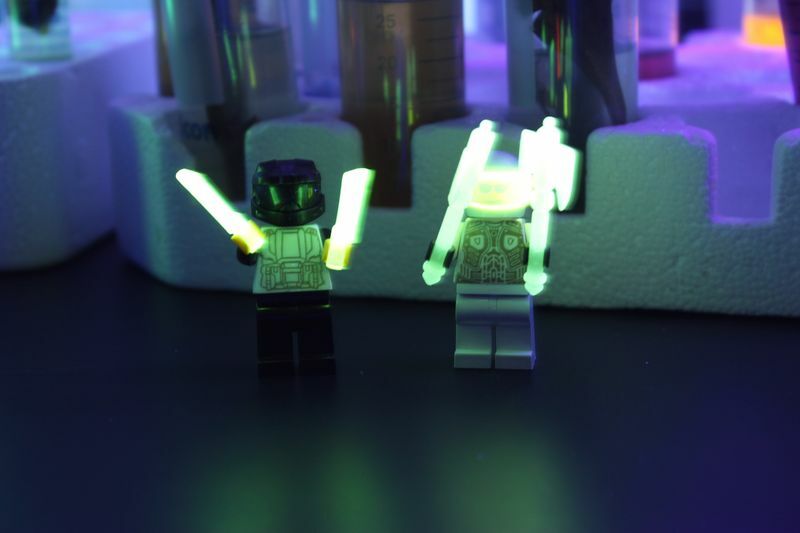 Many professionals exploit fluorescence to enable them to do their jobs more effectively. 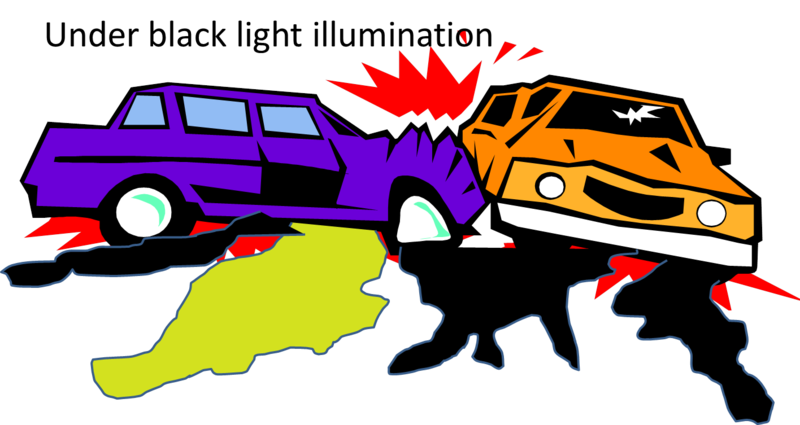 For example, car crash investigators use antifreeze’s fluorescence to understand accidents. In an exceptionally dirty situation, where automobile fluids are splashed everywhere, a crime scene investigator can pull out a trusty black light and cause antifreeze to fluoresce. 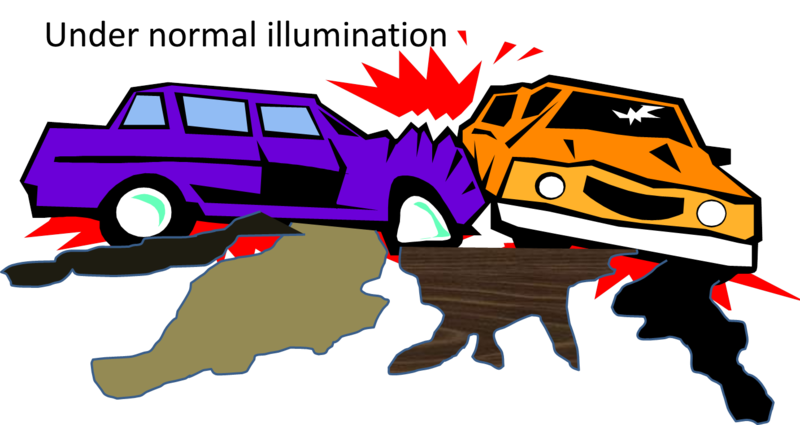 Antifreeze stands out amongst the other liquids that do not glow, making it easier to look just at the antifreeze and determine what happened during the crash. So what does this have to do with sustainable nanotechnology? Similar to the crime scene investigator, we scientists like to use fluorescence to make our lives easier. At the heart of our center’s goals is the idea of making nanotechnology safer and more sustainable. To do that, we first need to understand how current nanomaterials interact with simple organisms and cells (see Jared’s post from last week to see one such organism). Often this involves putting an organism or cell in contact with nanomaterials and attempting to watch where these tiny materials go. This is not an easy task, but thankfully we can utilize fluorescence to aid us in our endeavors. There are many nanomaterials that fluoresce, including titanium dioxide, diamond, and gold nanoparticles, along with one of our favorite types of nanoparticles, known as quantum dots. 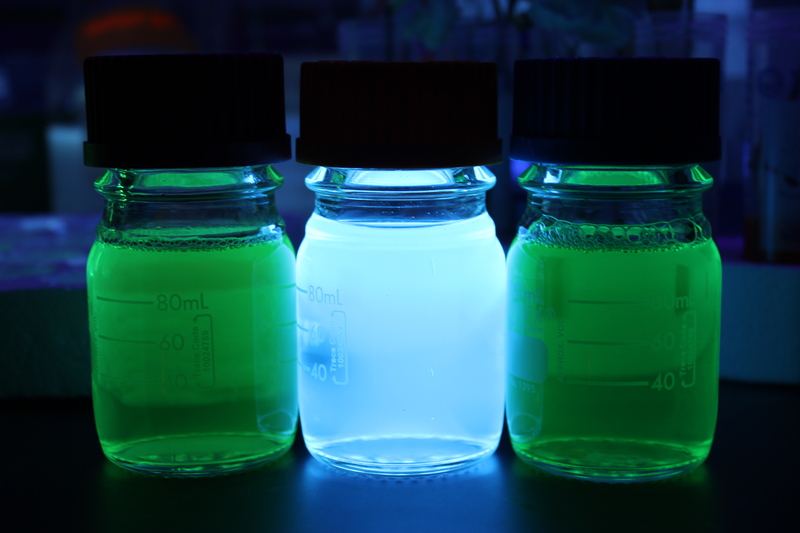 Quantum Dots of Different Sizes Fluorescing. Big shout out to Yizheng Tan for making the quantum dots and taking the awesome images!!! Once we add quantum dots to an organism, they become almost impossible to see under normal light. However, with the help of microscopes and different light sources we can cause our quantums dots to fluoresce and be seen. 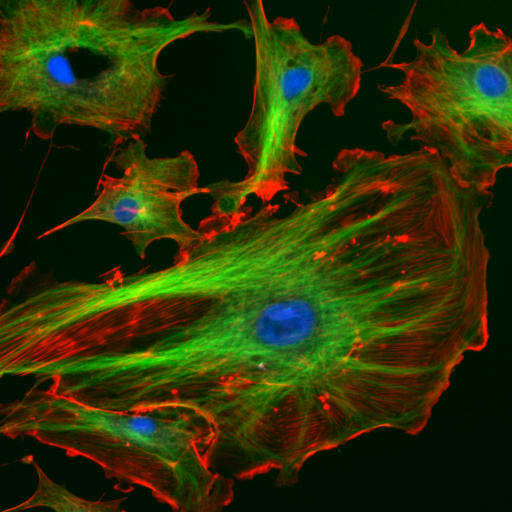 Just like the accident investigator, we make the quantum dots stand out against the background of other parts of the organism in order to see where they went and maybe even how they got there. Just like we can use fluorescence to track nanoparticles inside organisms, scientists already use techniques like this to look at different components of cells. 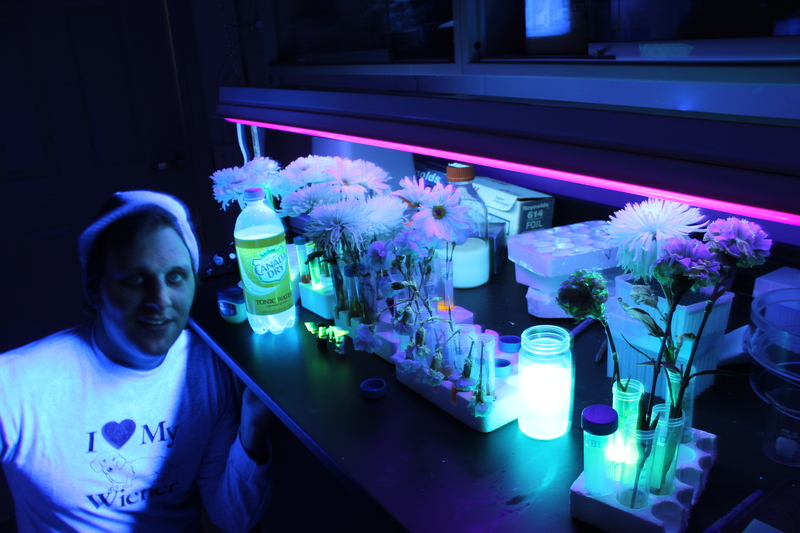 So, now that you understand a little about this hidden world of fluorescence, you may ask how you can use fluorescence to bring a little cheer into your own life. Say for instance, you are a scientist who works a little too often (e.g., ME) and therefore can really use brownie points with your fiancé around Valentine’s Day (again purely hypothetical). I’ve got your solution! Fluorescent flowers! The flower at left was only given water, while the two at right were fed a heavy highlighter diet. Open up a highlighter, pull out the ink cartridge, and squeeze a few drops into some water. Place some flowers into the very yellow solution and wait a day for the flowers to take up the fluorescent dye (this can be difficult for those with short attention spans). You will now have a beautiful glowing bouquet to present to your sweetheart. 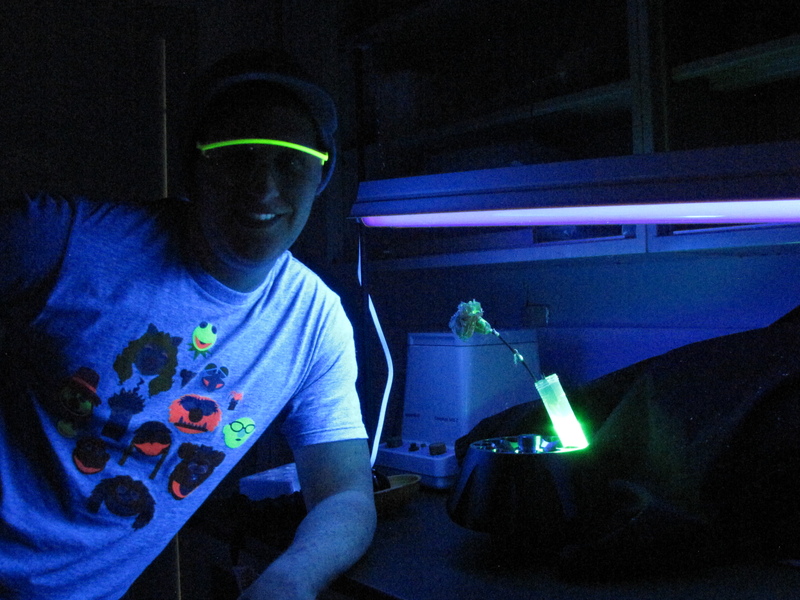 At the end of the day, fluorescence is a pretty big deal. It is all around us, makes peoples’ jobs easier, enables scientists to answer incredibly complex questions, and generally lights up many festive occasions. Without fluorescence the world would be a far duller place and much more difficult to comprehend. That’s all for now. Stay tuned for my upcoming post: How Small is Small?-A Nano Perspective. Hi, if I apply highlighter fluid on white paper, is the paper will grow more brightly under the UV Light. Can I change the color of a light bulb (or a Christmas tree light) with a highlighter or will the heat “evaporate” the color? Thanks! depends on what components are in the light interacting with the highlighter chemical. The chemical within yellow highlighters that fluoresces/glows is pyranine. In order to fluoresce, it requires excitation by light with wavelengths less than 400 nm. Both sunlight and most light bulbs contain at least some amount of radiation with wavelengths less than 400 nm, and therefore you would expect highlighter water to fluoresce or glow under most “normal” light. However, it is difficult to see this glowing as the room in which the glowing is occurring is bright and full of light. This is why we often rely on a black light to see things that fluoresce/glow as the black light provides the high energy, short wavelength radiation we need to excite the chemical, but also does not contain much visible light allowing the fluorescence (which is visible light) to stand out more easily. The glow from the highlighter/highlighter water can then be seen. One final point is that while we cannot see something fluoresce very easily in visible light, it is still fluorescing. This is why a highlighter still looks brighter than a yellow marker in “normal” light. 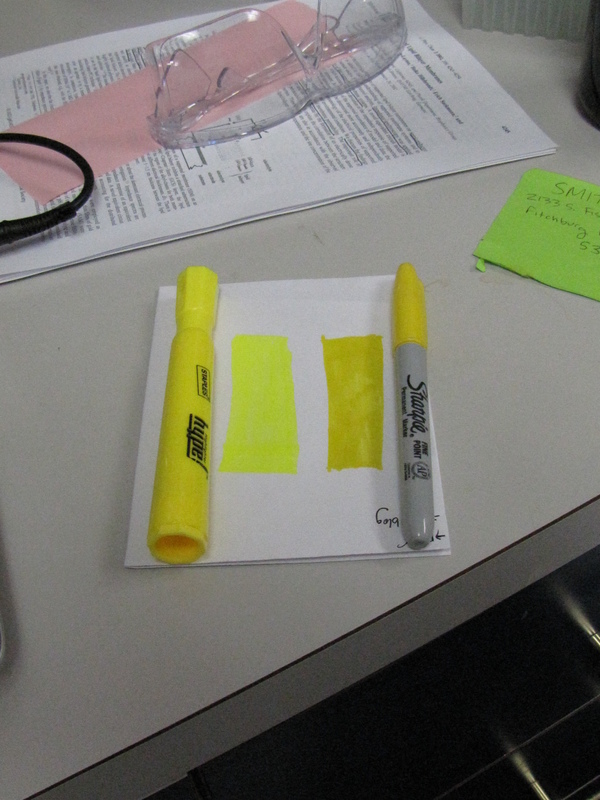 It has fluorescence added to the color coming from its yellow ink whereas the plain yellow marker does not. 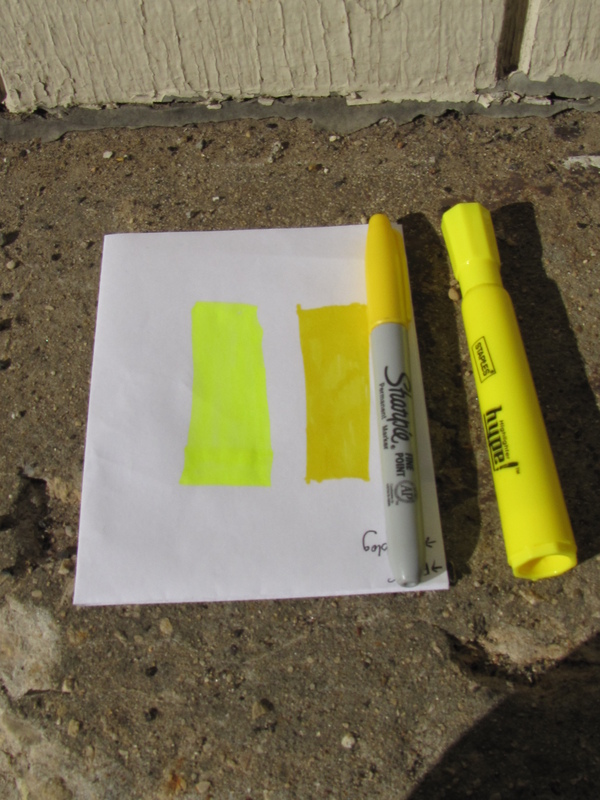 I refer you to the image within the post comparing a highlighter and a regular yellow marker in sunlight, which helps illustrate my point. I hope this gets the ball rolling in helping you get your question answered. Follow up with me if you would like any further explanation or clarification! I potentially see a future blog post about light and its components thanks to your curiosity! hi there, i am trying to duplicate your fluorescent flowers trick and am having a hard time, even with the full force of the internetz! can you describe the concentrations of highlighter fluid you used even vibe-ishly? did you cut the stems of your flowers underwater? what kind of blacklight did you use? since i saw so many examples of these online, i committed all-in to making a vase/lamp combo for holiday presents, and ive been experimenting for three days with no luck getting the fluorescence to appear in the petals (other than a few very small specks). i really dont want to have to draw on the flowers with the fluid, that would be so much less awesome! any specific details about your method would be much appreciated!! Great question!! 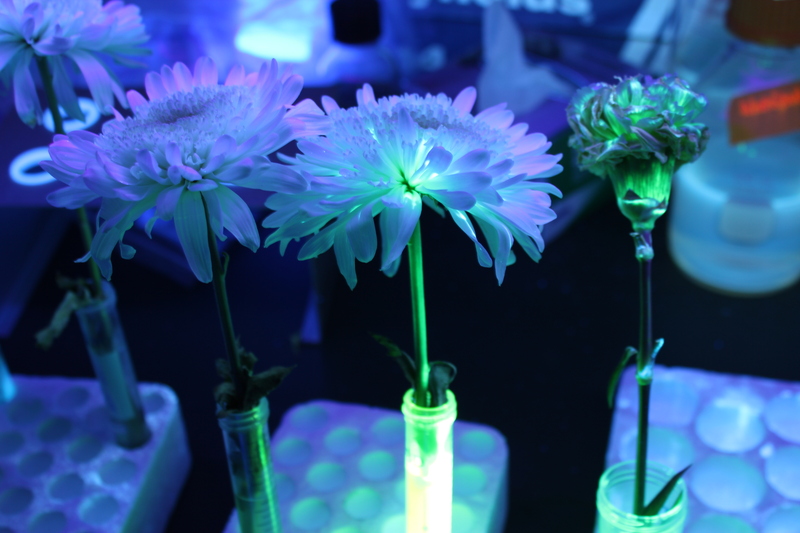 It is exciting to know that someone is attempting to make some fluorescent flowers. I will give you my best tips to ensure that your flowers turn out beautifully. First, I recommend using yellow highlighters, although other colors may work. You can test them under your black light to check. If you see them glow, that color is fine to use. Using a yellow highlighter, pull out the tube of marker ink (it usually helps to have gloves on). Squeeze the tube into water…at which point the water should turn a wild-looking yellow! As the flowers are not still growing, you can really use as much highlighter ink as you want. The more you use, the more likely it will be taken up with the plant. In terms of flowers, white flowers (daisies, dahlias, or the like) work best. The fluorescence shows up best with the white background. I do cut the stems at an angle prior to putting the flowers in water. I had success with adding flower food (what comes with cut flowers from the florist) to the mixture. In terms of black lights, I used both a handheld compact fluorescent black light bulb (60 watts) and a much more powerful overhead tube lamps. Both of the lights should be visible in the images in the blog (pictures 1 and 5). Write back with your hopefully successful next attempts! I would not expect the flowers to completely glow, although maybe you can out-do my flowers! I look forward to hearing about your efforts. Happy Science-ing! hey lee, if diamonds fluoresce as a nanoparticle, does graphite (since they are extremely similar structurally)? and if so/not, why? theifman!!!!! AMAZING QUESTION! It turns out diamonds and graphite, though they are made from the same element, carbon… they are extremely different structurally. Diamond is a big extended network of carbon atoms, each carbon atom bonded to four of its neighbors… while graphite is made of sheets of carbon atoms, one atom thick, each carbon atom bonded to three of its neighbors. These sheets then stack up, and its the sheets that come off of your pencil when you write on paper. These different structures give them tons of different properties, which is why graphite isn’t visibly fluorescent. Predicting whether or not something will be fluorescent is not trivial… I don’t understand it fully myself (working on it) so won’t try an explanation. gotcha. thanks for the quick reply. always great to hear from you. happy holidays man! nano is the future! Small changes to the molecular structure of any of these dyes can make large changes in their fluorescent properties (i.e. it can change the color of the light they emit). So rhodamine and coumarin dyes are just two classes of chemicals, and it is difficult to know exactly what the structure of the chemicals are. In general, fluorescent chemicals are organic chemicals with alternating double and single bonds (called “conjugated bonds”). I hope this helps! I know it’s a lot of information, but feel free to ask us a followup question! Can you tell, if there is any material that is excited in visible light rather UV, plz? Very impressive ! Never thought to use highlighters for this purpose. Nicely done! What would happen if you tried to water these flowers with tonic water? Tom Kuech, the Science Wiz (a la Bill Nye). Lame handle, but sweet article. Great job, Tom. I could actually understand what you’re talking about. Well done, Bud. You make your mom smile.